Earlier this month, TIFF held a one-day conference on women in film, games, and new media, the second in its Nexus series at the TIFF Bell Lightbox. (In total there will be four conferences, each with a unique theme.) The Nexus events are important for Toronto because they harness TIFF’s pan-industry reach to introduce the city’s media old guards—like film and television—to the new big thing—games—in a comfortable setting. This session focused on encouraging more women to get interested in games and to help diversify the current landscape. 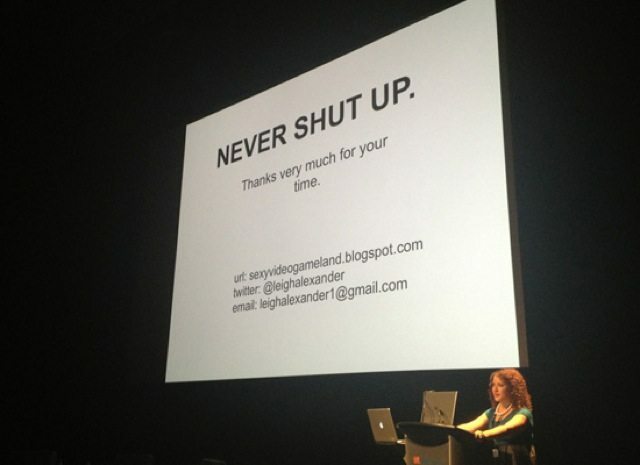 Keynote speaker Leigh Alexander shares her advice for women entering the games industry. Photo from the TIFF Nexus website. Toronto, in spite of (or, perhaps, because of) its relatively new status as an independent game development hub, provides a reference for other cities that need a model for how to catalyze inclusivity and accessibility within the games community. For example, indie game collective Hand Eye Society has launched two major projects to increase diversity, including the Difference Engine Initiative, which introduces women into the field to make games, and its spiritual predecessor, the Artsy Games Incubator, which focused on artists. (Some of the participants from the DEI took part in a panel moderated by Ubisoft Toronto managing director Jade Raymond, and all the games were available to play afterward.) The DEI recently completed its second round, bringing its total number of released games to 12, and also spawned a new group called Dames Making Games for women to meet and discuss games. Why is Toronto ahead of the curve in terms of gender equality? One reason could be that in other cities with older gaming communities, a boys’ club mentality could form, something Toronto, in its late coalescence, avoided. The liberal and progressive nature of the city likely plays a large role as well. And it could be that because of the number of other industries situated in Toronto, many of which have dealt with gender inequality for longer, the concept doesn’t seem as foreign as it might to more insular communities in other cities. Perhaps Alexander has figured out a root of the city’s social consciousness: the realization that, in the end, the best collaborations are the ones based on the passions shared by people—male or female—above anything else. CORRECTION: December 19, 2011, 3:30 PM This article originally indicated that Leigh Alexander was a contributor for the New York Times, when in fact Alexander has contributed to the Los Angeles Times.